The American public seems to expect many politicians to have a crooked side, but religious leaders tend to be more trusted. Perhaps that’s how one Ridgefield church official managed to pocket a sizable amount of money before being caught. 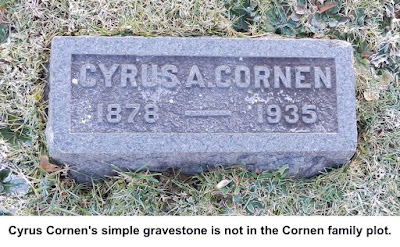 The son and grandson of two of the wealthiest men ever to live in town in the 19th Century, Cyrus Cornen wound up his relatively brief life as a poor traveling salesman far from home and family. 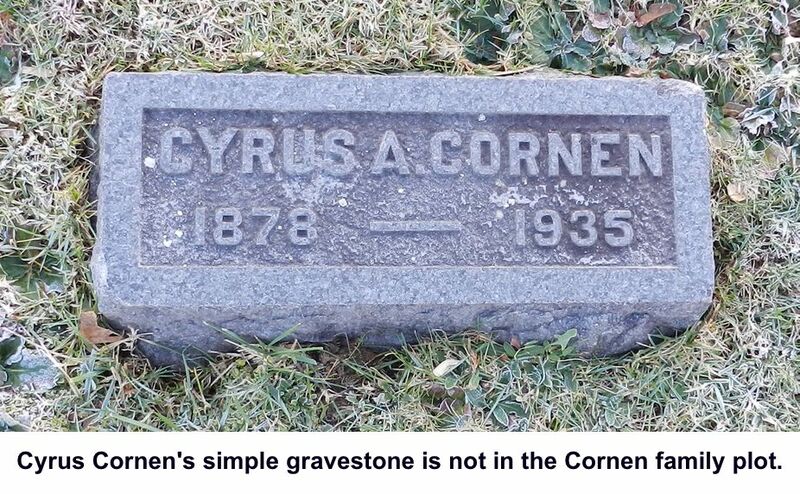 Cyrus Alexander Cornen Jr. was born in 1878 in the oil fields of Pennsylvania, where his father, Cyrus Cornen, and grandfather, Peter P. Cornen, both Ridgefielders, had moved to dig oil wells. Peter was among the earliest oil wildcatters in the United States; he was probably also Ridgefield’s first millionaire. He and Henry I. Beers, his brother-in-law, bought a 50-acre farm in Cherry Run, Pennsylvania, for $2,500. By 1864, the farm was dotted with oil wells. At one point the two rejected an offer of $4 million for the farm — $64 million in 2016 dollars. Peter Cornen was also a shrewd real estate man; in the 1860s, he acquired 16 lots in Manhattan. He sold them in 1872 for $65,000 — $1.2 million today. Part of Grand Central Terminal now stands on those lots. By his 20s, Cyrus A. Cornen Jr. was becoming involved in many aspects of hometown life, serving as master of the Jerusalem Lodge of Masons, a member of the building committee for the new Benjamin Franklin Grammar School (the “old high school” on East Ridge), treasurer of the Ridgefield Electric Company, an officer of the Ridgefield Savings Bank, and treasurer of St. Stephen’s Church, where he was also on the vestry and his family had been active for years. In 1910, he ran for and was elected town clerk. Around the same time, he was also elected judge of the town’s Probate Court. However, in 1916, suspicions began to arise that not all was going well with Cornen’s handling of finances for St. Stephen’s parish. St. Stephen’s had just completed a huge project: The building of a new church, the handsome stone structure that stands today on Main Street. The first service took place in May 1915, but the official consecration ceremony was scheduled for May of 1916, led by the Right Rev. Chauncey B. Brewster, bishop of Connecticut. However, a few months before the consecration, the vestry, the committee that oversaw the church’s operations, had begun to notice the church coffers seemed to lack some of the money that had been contributed toward the building project. Bills weren’t being paid — and the building had to be free of debt when the consecration took place. 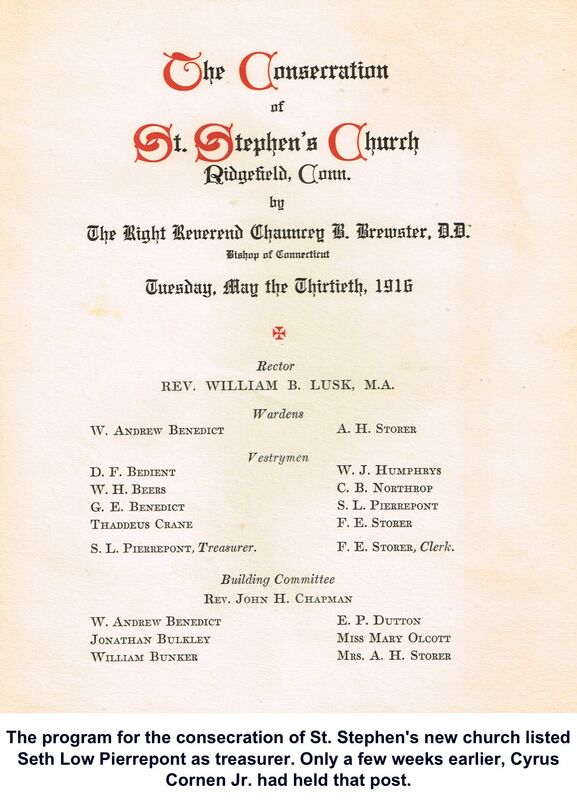 According to records and reports that Robert S. Haight uncovered for his 1975 history of St. Stephen’s, the rector and the parish clerk met with Cornen in the early spring of 1916. “From these discussions, it developed that the treasurer had virtually no records to support either expenditures or receipts,” Haight said. A committee was appointed to examine the situation with an accountant. “Surprisingly, considering the condition of the church’s finances, Mr. Cornen was reelected treasurer in April 1916. By early May the church faced an unexpected deficit of $13,000 — equivalent of more than $300,000 today. What Haight called a “whirlwind campaign” was undertaken to pay off the debt. And since St. Stephen’s had quite a few wealthy parishioners, the money was quickly collected and debt on the building cleared in time for the consecration ceremony May 30. Cornen resigned effective May 26, in time for the ornately printed program for the consecration to list his replacement, Seth Low Pierrepont, as parish treasurer. A millionaire diplomat and naval officer who later donated what’s now Pierrepont State Park, Pierrepont probably was largely responsible for getting Cornen’s losses covered, both through donations and his own money. There was extensive coverage of the consecration ceremony in The Ridgefield Press, but the leaders of the church were apparently able to keep Cornen’s financial misdeeds out of the newspaper. Nor was there any indication about his having taken money from the town through his posts as town clerk and probate judge until more than 50 years later when The Press, then under different management, said he’d reportedly pocketed an undisclosed sum. fathers to keep the whole affair secret. The newspaper’s editor and publisher, who may have known something was amiss, might have been a friend of Cornen. 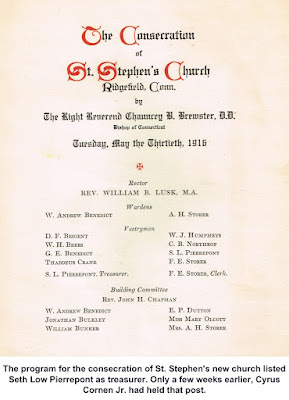 The editor at the time was David W. Workman; it is interesting to note that Workman’s wife later became clerk of St. Stephen’s Parish, serving from 1931 until 1953. Workman himself later became a town constable. Cyrus Cornen soon left Ridgefield, never to be seen again in the community. He and his wife, Annie Mae, first moved to Pittsburgh, Pennsylvania; his draft registration application from 1918 says he was working as a “motor truck salesman” at a business called Mueller Brothers, perhaps operated by an old family friend from the Cornen family years in the oil fields. By 1930 he was living in Richmond, Virginia, and three years later, he was in Newport News, working as a traveling salesman. He died there in 1935 at the age of 51, succumbing to the effects of high blood pressure. 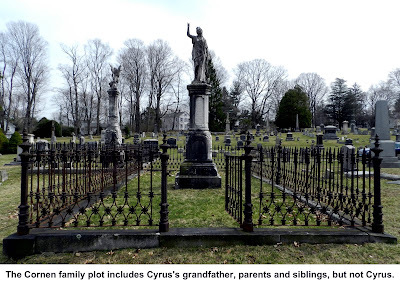 Cyrus’s body was shipped back to Ridgefield where he was buried in the Ridgefield Cemetery. There, the wealthy Cornen family has a gated plot, complete with one of the tallest monuments in any Ridgefield cemetery. 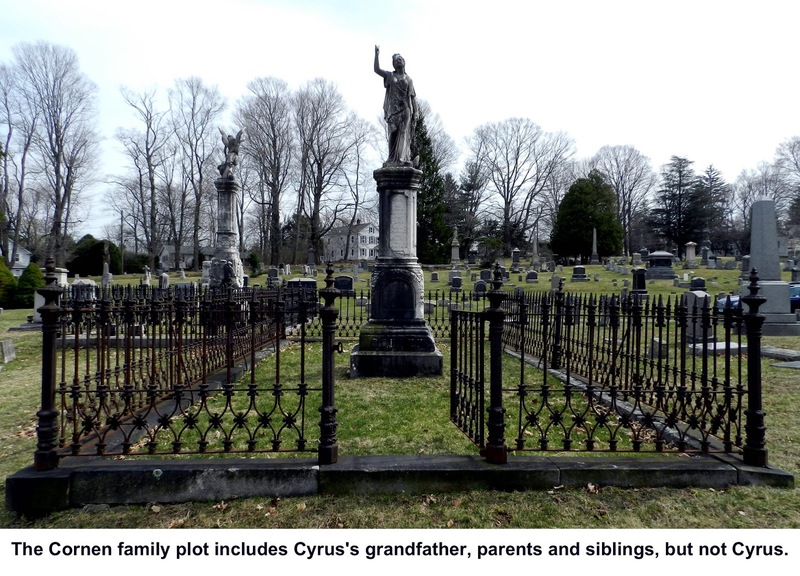 But Cyrus is not in the Cornen plot, perhaps a sign of his estrangement from his family. Instead he is buried with his wife’s parents, Richard and Roxana Nash Walker. Cyrus’s parents and four siblings who died young are all mentioned on the monument; he is not.